The variety of cuisine available in Brazil is amazing. In ways, it is totally alien to me and yet it bears many similarities to European food. Their cooking methods are not very different from the rest of the world but the raw materials are fascinating. My culinary journey began in Salvador, Bahia, which was once the capital of Brazil. Here the Afro-Brazilian culture (descendents of those brought to Brazil as slaves when the Portuguese empire reigned) is most prominent. An interesting cross-over between African and European styles can be seen here using indigenous ingredients. Salvador is a relatively poor city in Brazil and as such, I found the most interesting foods on the street, particularly acarajé, tapioca and açai. There is fierce competition amongst Salvador's acarajé stands as to whose is the best. Women reign supreme in these businesses and they take it very seriously. Each person in the assembly line has a specific role and they wear their beautiful traditional white garments while they work. Acarajé is made by boiling and mashing black-eyed beans, forming a fist sized ball from the mash and deep-frying it. It is then cut a couple of times across the top, much like a baked potato, opened out and covered with lovely toppings like vatapá, camarao (dried prawns) and a fresh salsa. It is quite a heavy dish and has quite a distinct flavour (particularly the camaroa) but it will leave you happily sated. You've probably heard of tapioca before. Sweet, creamy, like rice pudding, it is quite common as a dessert in the USA. In Brazil, however, its a little different. It is still made using the flour dried from the cassava (manioc root) but rather than wet it again, it is used dry. Like a crêpe, the flour is placed on a hit surface but it is shaped using a metal ring. The flour binds on the heat and then toppings, sweet or savoury, are added, again like a crêpe. It can be a little dry but this is quickly solved with the addition of cheese or a sweet sauce. Talk of this all-powerful fruit is becoming more common in Europe lately but they've been eating it in the Amazon for generations. The berries still grow naturally (rather than being cultivated) in the lungs of the world. The biggest challenge in distributing them is that they lose their goodness quite quickly. They are most commonly bought frozen as a result. If you find açai for sale in Brazil, it is most likely served as a sort of sorbet topped with bananas, condensed milk and granola. It is difficult to describe the flavour of this delicious fruit but its somewhere between chocolate and blackberries. Hard to believe, then, that it is very good for you and full of antioxidants. I hope we see a version made with indigenous Irish fruits in the near future. After Salvador, I ventured South to the second capital city in Brazil's colonial history, and its biggest tourist draw, Rio de Janeiro. Here, though local tradition is still strong, the influence of the rest of world is much more apparent. Yes, you'll find every sort of cuisine under the sun in Rio but the best way to break into local cuisine, to see what you're getting and learn it's name, is to visit a ‘por kilo’ (pay by weight) restaurant. I couldn't speak about Brazilian food without mentioning feijao (beans). Feijoada is a hearty stew made with feijao. Some of the beans are mashed into a paste to thicken the sauce while others are left whole. They are accompanied by little pieces of pork. It's normally eaten on a bed of rice. Delicious. There's no shortage of creativity when it comes to politicians and elections in Brazil these days, but that's hardly a new phenomenon. In 1945 year, when contesting the presidential election, one very enterprising brigadier, Eduardo Gomez, tried to reach the voting public's hearts through their stomachs. (I like his style.) He went around doling out a little round sweet treat made from dulce de leche and chocolate and covered in chocolate sprinkles. 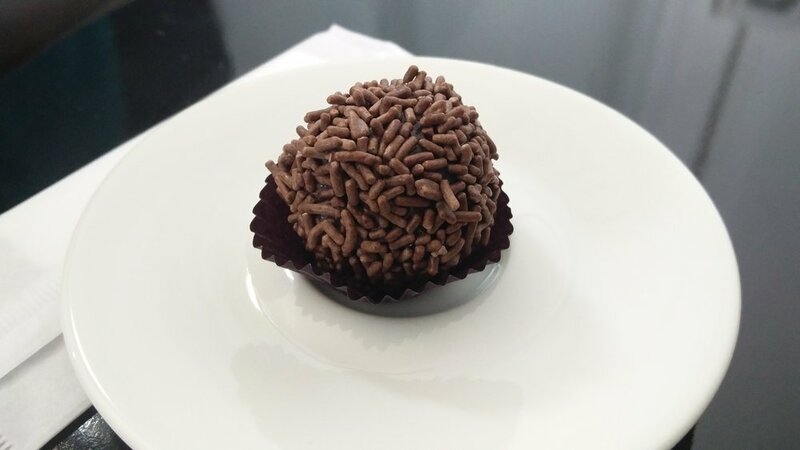 Regardless of what that dessert was called at the time, it became known as (and shall forever be called) ‘brigadeiro’ and Rio is the place to try it. From the former capital to the real capital, I continued south to São Paulo (the administrative capital is Brasilia, but with the largest population, São Paulo is the largest). Its difficult to say whether Brazilian food is truly to the fore in this enormous cultural and culinary melting pot, as it boasts some of the best Italian and Japanese food outside of their own countries, but there are some local gems in this supercity and they certainly merit a mention on this journey. 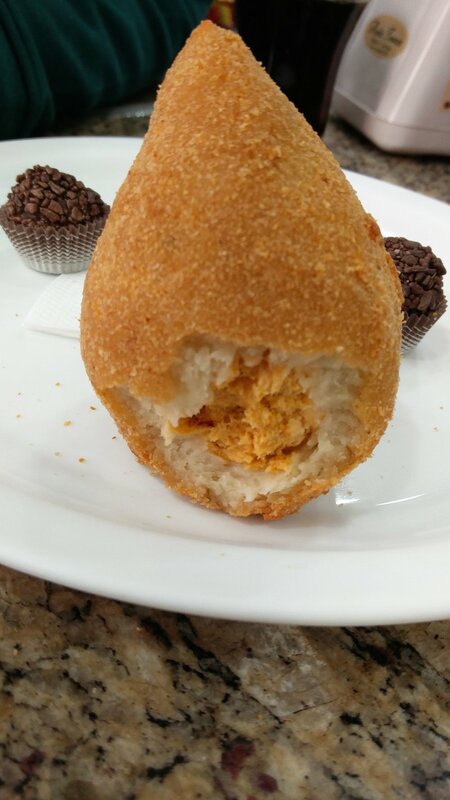 One of my favourite things about Brazil, coxinha can be found all over São Paulo. The story behind them is that the son of Princess Isabel would only eat chicken thighs. Under pressure one day, having run out of thighs, the cook took the bones from the legs already consumed, wrapped them in the shredded meat from other parts of the bird, covered them in dough and breadcrumbs and deep-fried them. They still come in the same shape now but without the pre-chewed bone. They are normally filled with chicken, cream cheese and some spices. If you visit São Paulo go to the Mercado Municipal. The massive space is filled with stalls selling all kinds of ingredients and the fruit sellers in particular try their level best to get you to sample their produce. For me personally though, the highlight of the experience had to be the city's most famous sandwich, the Mortadella. A French roll, a wad of thin slices of Bologna fried together and covered in melted cheese. Despite the fact that none of these individual ingredients are particularly Brazilian, the combination is very much part of the culture of São Paulo. As I ventured further south, the influence of the rest of the continent, rather than the rest of the world, became more apparent. Churrasco is quite like the Argentinian asado. Effectively it is an all you can eat buffet but the food is presented in two very different ways. The salads, cooked vegetables and everything but the meat is available at the buffet counter and the quality is high. Then, as you're seated, waiters make their way from table to table with various cuts of meat from different animals, everything from ribs to steak, from trotters to chicken legs as well as sausages and cheese, all cooked over a flame. They will continue to cut fresh slices onto your plate until you ask that they take the plate itself away. As long as you manage to control yourself somewhat, it's a great experience. Nearer the coast in the south, I came by train to a beautiful little town called Morretes. Hundreds arrive here on the Serra Verde Express (nothing express about it) and on landing every eatery offers ‘the best’ or the ‘original’ barreado. It's a sort of slow cooked beef stew eaten with manioc flour, slices of banana and a squeeze of orange juice. If you do try it, be sure to mix it well or the dry flour will have you coughing for days. Otherwise, it is a very tasty dish. Of course, as soon as you think of Brazil you think of one of their main exports and something very close to my heart, coffee. You can find it everywhere, certainly, but the traditional approach to brewing and consumption is quite different. Firstly, it is brewed by pouring hot water on grounds in a filter, similar to the kind found in many American homes although it is a little less polished looking. Rather than leave it on a hot plate, they immediately put the brown fuel in a thermal flask and drink small cups throughout the day. Espresso machines were few and far between. As often happens the world over with the most valuable natural resources, unfortunately, the best is exported. Before coffee became the focus, however, another form of natural energy was being farmed here: sugar. Travelling around the country, it is difficult to avoid the stuff. You're more likely to be served cake than cornflakes for breakfast! Aside from the variety of uses for the processed sugar, the Brazilians have a very interesting use for the raw cane. An the street you'll find vendors with a sort of machine through which the cane is passed again and again to squeeze out the sweet juice. They pour this over ice and flavour it with a slice of lime and drink it just like that. It is called caldo de cana and it is delicious and refreshing on a hot day. Unfortunately, despite having the best of raw produce in their markets, fresh fruit and vegetables rarely seem to reach menus and it can be difficult to avoid salt, sugar and meat. That said, with indigenous ingredients and recipes from Europe, Africa and of course Brazil, coming together in different ways across the country, there is certainly food for thought in the cuisine.